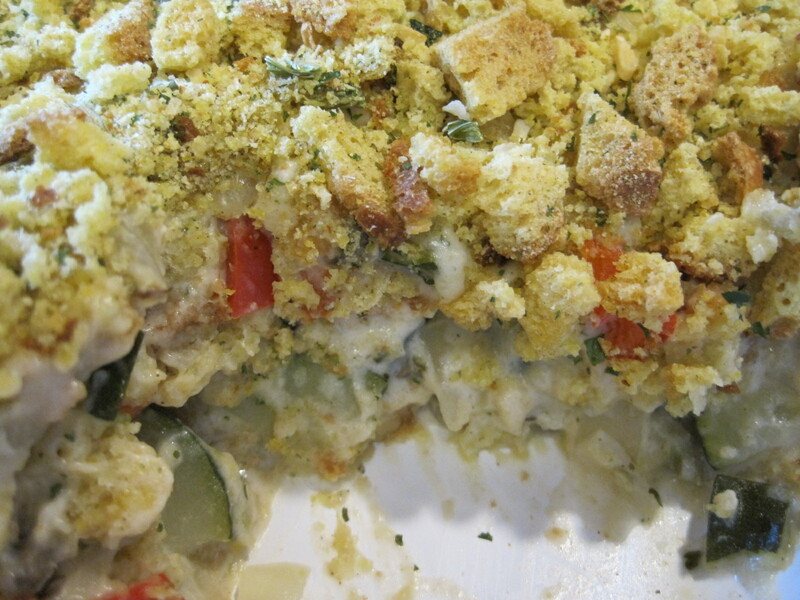 Country Zucchini Casserole is a great way to use up that abundance of zucchini that is almost always prevalent, at some point, during every home gardeners summer. I don’t know about you, but I’m always looking for new ways to use up the zucchini harvest from my summer garden. Most years, I have a bumper crop of zucchini. The best crop I ever had was 20 pounds per week, but one year, the zucchini weren’t very productive. That year, we had more crookneck and patty pan squashes, but I suspect that any type of summer squash, or even a mixture of them would work well in this recipe. I hear a lot of women talk about how picky their spouses are. Mine is a pretty good sport, but when I’m making something new, there are times when dinner doesn’t get on the table without a struggle. This recipe is a case in point. Baker’s man wandered into the kitchen while I was was beginning to saute the onions and bell peppers. The smell of onions, or garlic, often lures him into the kitchen. When he made his entrance, I was chopping the zucchini and tossing it into my large measuring cup before adding it to the skillet with the other veggies. 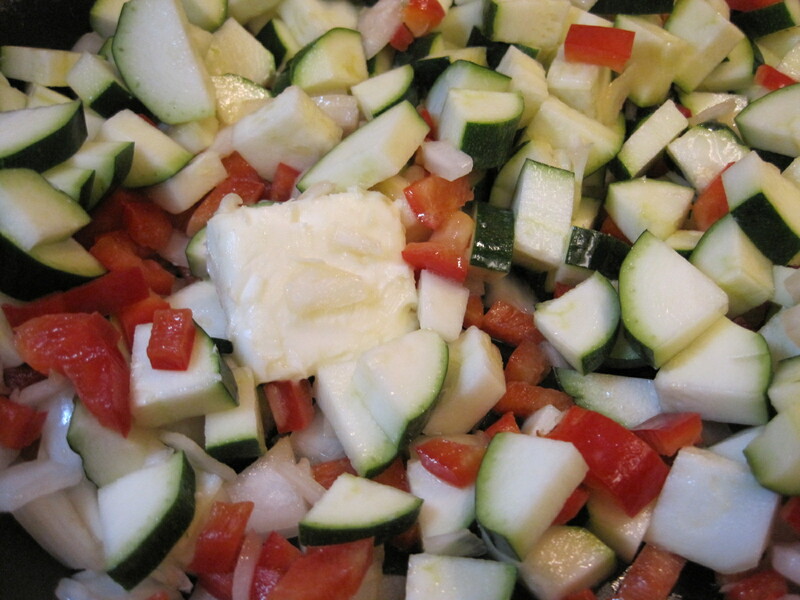 “Chopping zucchini for the Country Zucchini Casserole.” My tone was matter of fact. “We’ll see.” I replied as he mumbled something under his breath and wandered out of the kitchen. We’d already had a similar discussion about the Baked Cinnamon Apple Pork Chops which were already in the oven. To be honest, I was very skeptical about this recipe. A friend, who prefers to be nameless, had heard about this recipe from a friend of hers, but I was concerned that Country Zucchini Casserole might be an epic fail. I’m happy to report that my concerns were unwarranted. When the casserole came out of the oven, I served Food Critic first. As I served him, a small piece of the casserole fell off of the spatula and landed on the stove top. I picked it up and popped it into my mouth, and it was good. “This Country Zucchini Casserole is bomb.” I reported to my spouse. “Says who?” He asked, suspiciously. He made that snorting, grunting sound that some husbands make when they’re unconvinced. I assured Bus Boy that there were no explosive devices in my kitchen, but he still didn’t want to try the casserole. I served Baker’s Man his dinner, and as he tasted it, he made his happy, I like this, grunting sound. I knew the Country Zucchini Casserole was a winner when he went back into the kitchen for seconds. He liked it. Baker’s Man really liked it. Food Critic did, too. Only Bus Boy rejected it, but he prefers his foods to be separate. He’s weird that way. This recipe makes a great accompaniment to meat dishes, but it would also make a great vegetarian entree. Of course, the portions would need to be larger if this was served as an entree. 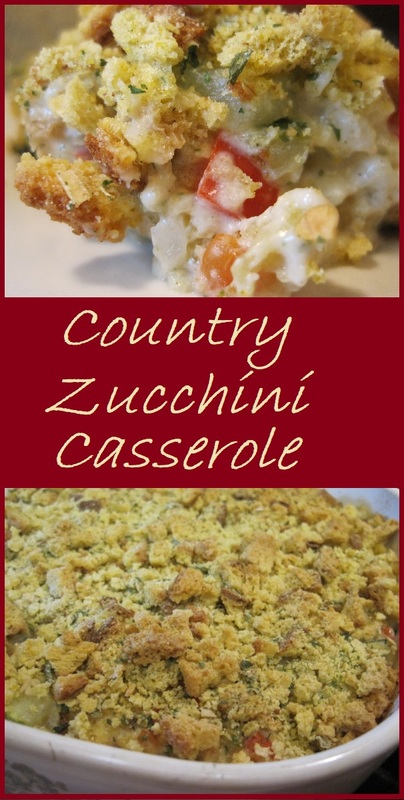 Give our recipe for Country Zucchini Casserole a try and let us know what you think by leaving a comment below. This recipe is a perfect way to use up excess zucchini, and I suspect it would work well with any summer squash. This casserole is creamy and satisfying and makes a perfect side for any weeknight meal, but it could also double as a meatless entree. The total cost of this recipe is $5.63 or about $0.94 per serving. Add bell pepper, onion, zucchini, and broth. Bring to a boil then reduce heat and simmer until vegetables are tender, between 8 and 10 minutes. Remove the vegetables form the heat and stir in the mushroom soup, sour cream, and ¾ of the stuffing mix. 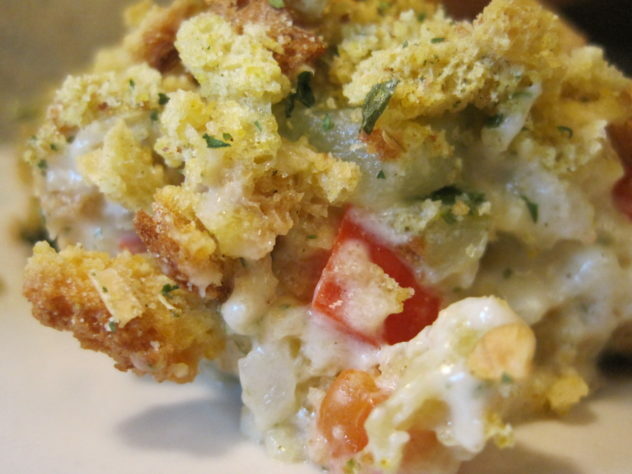 Pour into a 1½ to 2 quart casserole dish that has been greased. Sprinkle the remaining stuffing mix over the top. Nutrition information is for 1/6th of the casserole prepared according to the recipe above. Sounds and looks delectable. I especially enjoy any dish with stuffing. Also looks as if I could make it …and later bake it? Served with a roast chicken it was a hit with my family! It is very hearty, and it would be great with chicken, too. Ok, this looks and sounds delish! I love the nicknames in your post! So fun! I too often have a lot of zucchini leftover. 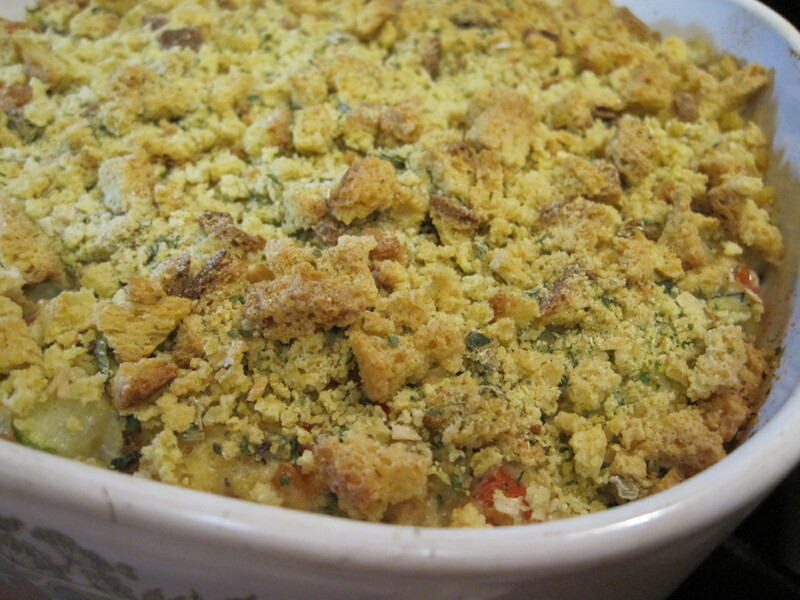 My husband loves zucchini and he loves his cornbread stuffing mix! That means I will definately be making this one for my family to try! Thanks for a great recipe! Amanda, in the beginning, my family all insisted on “code names” to be used on the blog. Now, I don’t know if they would care. As for this recipe, my summer gardens almost always produce an overabundance of zucchini, so I try to find new ways to use it up. I hope your husband likes the country zucchini casserole as much as mine does. I would happily eat your country zucchini casserole as it looks delicious! My husband is a good sport too, but he eats just about everything! I look forward to trying your recipe! Elaine, I hope you give this a try. It was very good. It will be in regular rotation during the winter months in our house. This would be amazing with a roasted chicken! Or even as a side dish for Easter. Definitely going to try this yummy dish! Jessica, I hope your family likes this as much as ours did. You’re right that his would go great with chicken. Dominique, you’re right. This is a very sneaky way to get people to eat vegetables, especially after they take the first bite. This dish looks like it comes together so easy and would be a great one to take along to a tureen dinner. Thanks for sharing! You’re right about this being easy to prepare, and it would be a good pot luck dish, too. Such a tasty and creative way to use up zucchini – I always buy so much! This would be great as a side, but my veggie friends would love this as a main course as well! My friend, Angie, and I were recently talking about this being a good, vegetarian, entree. Thank you, Carrie, for confirming what we were thinking. Having raised 4 sons (and a husband), and now having 2 little grandsons, I enjoyed your description of your time in the kitchen! Haha. 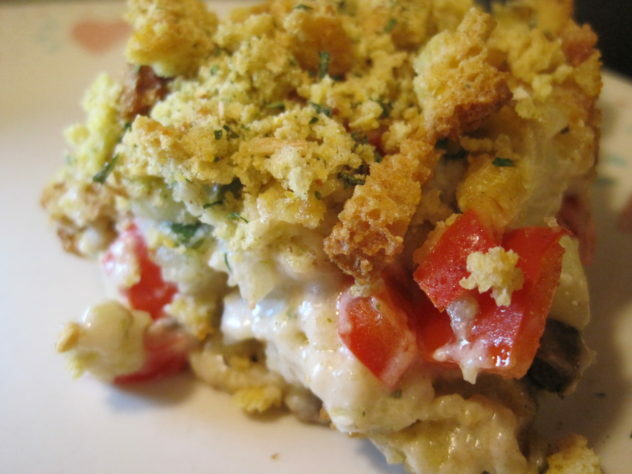 This looks like a hearty, filling dish to satisfy those big appetites! This dish is very hearty, but it doesn’t leave you feeling heavy. That’s why I love it. I’m glad you enjoyed my description of my interactions with Baker’s Man during meal prep. I think we may be married to the same man. Sometime my Honey can be very skeptical but in the end he will admit when it’s a great recipe. We love our zucchini!! We are now in our zoodle stage. I know — we’re behind everyone. Your recipe is a keeper. Will save it for this summer. I think there are several versions of this model husband around. I have a hand held spiralizer, but I haven’t made zoodles yet. Since I’m starting 30 days of vegan, I suspect I will probably try them at some point this month. Easy, and simple, are my favorite ways to prepare anything on weeknights. I also love with a meat-obsessed fella but I’m positive he would go back for seconds of this meat-free dish as well. Looks scrumptious! I made this twice, and the second time, he wasn’t enthusiastic until he tasted it. It was as if he had memory loss. He didn’t want it. Then, he had seconds. Men…they can make you crazy. This looks so good I want to reach in a grab some! Love that you’re using zucchini as the main part of the dish. I’m always looking for new ways to prepare Zucchini since we almost always have a bumper crop. I was very happy with this recipe, so I’m definitely going to be using it this summer.